This unit is ideal for any application where an accurate, regulated DC output is required. 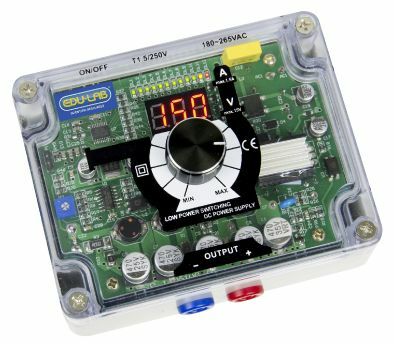 It is easy to use with digital Voltage and visual Current displays and the transparent case has proven very popular in Schools/Universities as students can easily see the components and thus offers some incidental education. A continuously variable voltage of 0-15V in 0.1V increments offers a solution for a diverse range of applications especially with the regulation (see technical specification) and accuracy to +/- 0.5% and the output sockets fit both shrouded and standard leads. The compact design (11x9x5cm) means it won’t take up precious bench or storage space (12 fit into a Shallow Gratnells® tray and 15 into a Deep tray). Full CE Certification and a 3 year Warranty mean you can buy with confidence.